Christmas is celebrated in many ways across the varied landscapes and diverse families in Chile. 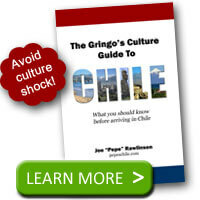 I experienced a Chilean Christmas twice during my time in Santiago and central Chile. Since Chile sits in the southern hemisphere, Christmas arrives in the middle of summer. The kids have finished their year of school and enjoy the warmer temperatures and the long summer days. Chileans call Santa “Viejito Pascuero” (meaning Old Man Christmas) or even “Papa Noel.” Just like around the world, he travels by sleigh and reindeer and brings toys and gifts to good boys and girls. Traditionally he will come in the chimney or climb through the window to deliver his presents. Christmas is a time when families come together to enjoy each other’s company and some home cooking. Many Chilean households consist of several generations and these numbers are augmented at Christmas as other relatives come to visit. People send Christmas cards and buy gifts for friends and loved ones. Chileans and Chilean businesses get ready for the big day by decorating. Families put up Christmas trees and decorations. Besides the traditional Christmas tree, you’ll see nativity scenes with baby Jesus, Mary, Joseph, the shepherds, animals, and the three wise men. Families usually gather together by late afternoon on Christmas Eve to begin the celebrations. A large dinner is served in the late evening. This consists of typical Chilean foods, oven roasted chicken, turkey, or other special meal. Pan de Pascua, a sweet fruit cake dessert, is always a staple for this holiday. A traditional drink called “Cola de Mono” or “Monkey’s Tail,” made from coffee, milk, liquor, cinnamon, and sugar is served during Christmas time and New Year’s. Near midnight gifts are exchanged and opened. Kids will take their new bikes or other toys and head out into the streets to show them off and to play with friends. This excitement is carried over to adults who often stay up late on Christmas Eve celebrating with friends and family. Gifts are enjoyed and the children will take their new toys out and play. You will see lots of kids on new bikes and skates. People will also go and visit friends and family during the day. Some families have the tradition of going to the pool or beach on Christmas. For those at home, television channels’ programming is filled up with Christmas movies and cartoons. Most Chileans don’t forget that Christmas is centered around Jesus Christ. Many will attend church services including the traditional Christmas Eve mass. Carols are sung and families often read the Bible passages recounting the birth of Jesus. 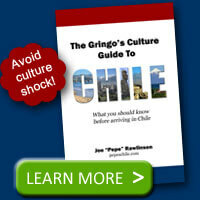 Christmas is one of many holidays that Chileans celebrate, learn more in the Gringo’s Culture Guide to Chile.